We begin to flow again in one direction. No doubt it is a movement planned up there, back yonder, by the chiefs. We trample soft bodies underfoot, some of which are moving and slowly altering their position; rivulets and cries come from them. Like posts and heaps of rubbish, corpses are piled anyhow on the wounded, and press them down, suffocate them, strangle them. So that I can get by, I must push at a slaughtered trunk of which the neck is a spring of gurgling blood. The ground is so full of dead that the earth-falls uncover places that bristle with feet, with half-clothed skeletons, and with ossuaries of skulls placed side by side on the steep slope like porcelain globe-jars. In the ground here there are several strata of dead and in many places the delving of the shells has brought out the oldest and set them out in display on the top of the new ones. The bottom of the ravine is completely carpeted with debris of weapons, clothing, and implements. One tramples shell fragments, old iron, loaves and even biscuits that have fallen from knapsacks and are not yet dissolved by the rain. Mess-tins, pots of jam, and helmets are pierced and riddled by bullets—the scrapings and scum of a hell-broth; and the dislocated posts that survive are stippled with holes. It’s a clunky old translation, but the power of Barbusse’s prose still shines through. Small wonder that he later confided: ‘I once used to think that the worst hell in war was the flame of shells; and then for long I thought it was the suffocation of the caverns which eternally confine us. But it is neither of these. 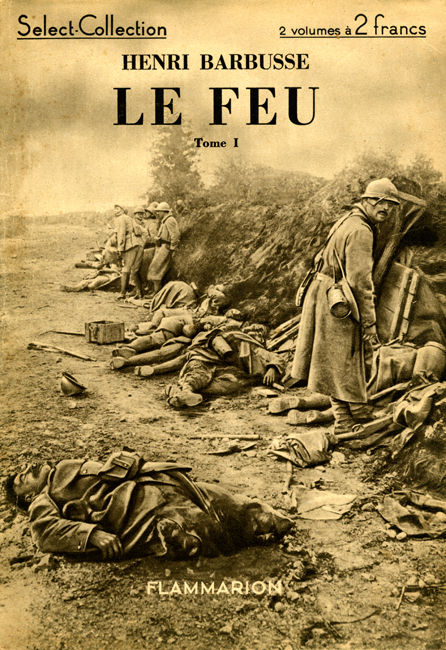 Hell is water.’ (If you want more on these imaginative geographies, incidentally, I recommend Susan Grayzel‘s short essay on Barbusse and, more generally, Claire Keith‘s ‘Pilgrims in a toxic land: Writing the Trenches of the French Great War’ in Jeff Persels‘s collection, The environment in French and Francophone Literature and Film (2013) pp. 69-85). It’s been praised to the skies – see, for example, this review in the New York Times and this review at the Daily Beast – and Barthas’s spirited socialism and pacifism make it all the more interesting. But, for me at least, it doesn’t capture the slimescape with the same intensity as my second book: Gabriel Chevallier‘s Fear. I confess to being taken aback by its very existence. In another life – in grammar school – my French teacher, a wonderful man called Robert Bratcher, recommended Chevallier’s Clochemerle as a way, I now suspect, of teaching us what ‘Rabelaisian’ meant without actually having to read Rabelais. It’s a brilliantly comic novel (or at least it seemed so to this fifteen year-old), shot through with word play, artful phrases and visually, almost viscerally immediate staging in which the body – and the fear of/fascination with its functions – loomed large. reading Fear feels like being led through the damnation panel of Bosch’s “The Garden of Earthly Delights”, the front line “blazing like some infernal factory where monstrous crucibles melted human flesh into a bloody lava”. There are wince-inducing close-ups of mutilated men and corpses. Chevallier’s turn of phrase, brilliantly rendered in Malcolm Imrie’s translation, makes this distant war feel horrifying and close. Dartemont’s ultimate triumph, beside surviving, is in never having allowed himself to become dehumanized. 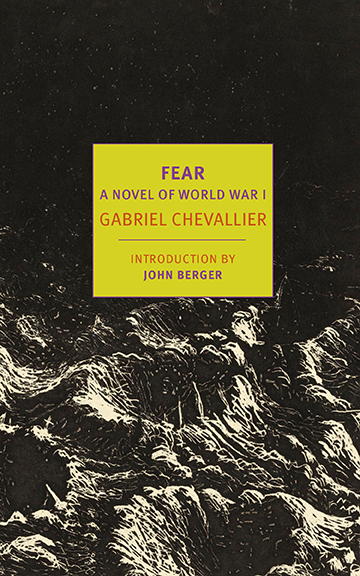 … above all “Fear” is a novel whose most indelible passages describe the sensory degradation of war on the human body. These baroque descriptions are generously translated into English by Malcolm Imrie without a hint of stiltedness [in fact, Imrie won the Scott Moncrieff Prize for his translation]. A face is described as seeming to “acquire a dull, gray coating, as if someone had forgotten to dust it, and the beard, drawing strength from the compost of unhealthy flesh, spread rapidly, seeming to drive out life, like ivy takes light from the front of a house.” It is the kind of powerful prose that helps to make Chevallier’s long-neglected novel one of the most effective indictments of war ever written. All of this reading is in part preparation for a trip later this month with an old friend to the battlefields of the Western Front (we’re still arguing over which of us is Blackadder and which is Baldrick, but it’s really no contest): watch this space for a report. 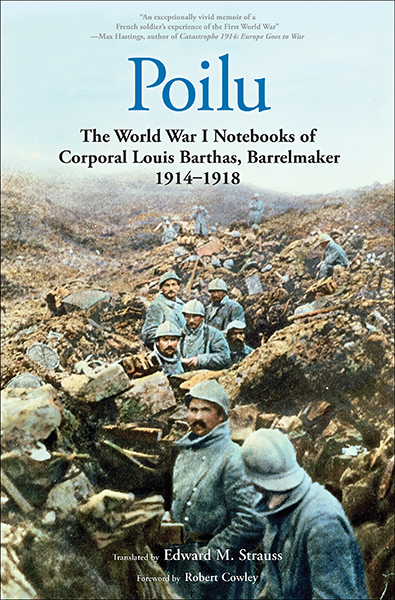 This entry was posted in books, nature, World War I and tagged French Army, Gabriel Chevallier, Henri Barbusse, Louis Barthas, slimescape, trench warfare, Western Front by Derek Gregory. Bookmark the permalink.